PURPOSE: The purpose of this study was to evaluate the effect of the African potato (AP) on the pharmacokinetics of efavirenz. METHODS: A single-dose, two-phase sequential study was conducted over 31 days in 10 healthy volunteers. On day 1 of the study, volunteers were administered a 600 mg efavirenz tablet, and blood samples were collected before dosing and at 0.5, 1, 1.5, 2, 2.5, 3, 3.5, 4, 5, 6, 8, 12, 18, 24, 36 and 48 hours after dosing. From day 16, a traditionally prepared AP decoction was administered daily until day 30. On day 29, volunteers were administered a single 600 mg dose of efavirenz, as was done on day 1. Plasma samples were harvested immediately after blood sample collection and frozen at -80°C until assayed. Plasma concentrations of efavirenz were determined by a validated high performance liquid chromatography (HPLC) method with UV detection, and pharmacokinetic parameters were calculated. Geometric mean ratios of Cmax and AUC0-48 of efavirenz before and after co-administration of 14 successive daily doses of AP were compared. RESULTS: All subjects completed the study. The geometric mean ratios of Cmax and AUC0-48 were 97.30 and 102.82 with corresponding 90% confidence intervals (CIs) of 78.81 - 120.14 and 89.04 - 118.80, respectively. CONCLUSION: Pharmacokinetic data generated during this study indicated that AP did not significantly alter the pharmacokinetics of efavirenz. Hence, co-administration of AP is unlikely to affect the clinical usage of efavirenz. Hypoxoside, the main component of the AP,15 is not absorbed through the gut but is extensively metabolised in the colon by β-glucosidase to rooperol, which is then absorbed into the bloodstream16,17 and undergoes further metabolism to glucuronides and sulphates. In vitro studies have shown that hypoxoside induces the transporter protein, p-glycoprotein (P-gp) in Caco-2 cells, and stigmasterol, which is a constituent of AP, and rooperol both exhibited high inhibition of CYP3A4, 3A5 and CYP19 enzymes.18 Ingestion of the AP may therefore have the potential to affect both transporters and enzymes and consequently interfere with the absorption and metabolism of concurrently administered therapeutic agents. Efavirenz is a non-nucleoside reverse transcriptase inhibitor (NNRTI) which is effective against HIV-1 infection and is the backbone of highly active antiretroviral therapy (HAART) in South Africa.19 Efavirenz is a substrate of both CYP3A4 and CYP2B6,20 and the metabolites are 7-hydroxyefavirenz, 8-hydroxyefavirenz and 8,14-dihydroxyefavirenz. It has a long half-life (of 52 - 76 hours) when administered as a single dose and 40 - 55 hours after multiple doses. The reduced half-life after multiple doses is due to metabolic auto-induction. Efavirenz is not a substrate of P-gp21 and therefore the absorption of efavirenz is unlikely to be affected by inducers or inhibitors of P-gp. Since efavirenz and AP have been shown to be CYP450 enzyme substrates, the possibility exists of interaction between them when simultaneously administered. Reports have indicated that AP inhibits CYP3A4 in vitro.18 However, to our knowledge there is no published information that this occurs in vivo. We therefore investigated whether the concurrent administration of AP would affect the pharmacokinetics and subsequent clinical performance of efavirenz in human subjects. The HPLC system consisted of a Waters model 515 HPLC pump, a model 715 autosampler and a model 2995 PDA UV detector (Waters, Milford, MA, USA). Efavirenz was donated by Aspen Pharmacare (Port Elizabeth) and diclofenac sodium (DIC) was purchased from Sigma-Aldrich (Johannesburg). Acetonitrile and methanol of HPLC grade were purchased from Romil Ltd, Cambridge, UK, and formic acid 99.9% from Associated Chemical Enterprises, Johannesburg. Water was purified by reverse osmosis and filtration through a Milli-Q purification system (Millipore, Milford, MA, USA). Human plasma with potassium edentate (K-EDTA) as an anticoagulant was obtained from South African National Blood Services, Port Elizabeth. Ten healthy, non-smoking, HIV-negative male subjects were enrolled after giving informed consent. Eligibility criteria included age between 18 and 55 years and a body mass index (BMI) between 19 and 30 kg/m2. Pre-study medical screening was performed within a month of initiating the study, and volunteers who passed the physical, medical and laboratory screening tests were enrolled. Laboratory tests included tests for liver function, hepatitis B and C, HIV, blood biochemistry, urinalysis and drugs of abuse (including amphetamines, barbiturates, benzodiazepines, cocaine, methamphetamine, morphine, phencyclidine, THC and TCA). Prescription and over-the-counter medicines were restricted from 1 week before each phase until the last blood sample had been taken at the end of the study. Consumption of alcohol was forbidden from 4 days before the study, and caffeine and grapefruit juice were restricted from 48 hours before the study. Volunteers were prohibited from strenuous exercise from 24 hours before the study. Ethical approval was granted by the Rhodes University Ethical Standards Committee; the study was conducted according to the South African Good Clinical Trials guidelines22 and Declaration of Helsinki and its amendments. A single-dose, two-phase sequential study was conducted in healthy male volunteers under fasting conditions. Phase 1 started on day 1 and phase 2 started on day 29, each phase lasting 3 days. The washout period between the administration of the efavirenz doses was 28 days. The night before the study (day 0) volunteers were checked into the clinic and tested for drugs of abuse and alcohol consumption and questioned to ensure that they had complied with the study restrictions. Volunteers fasted for 10 hours before they were administered a 600 mg efavirenz tablet with a 240 ml glass of water. Standard meals were provided until 24 hours after dosing, and the times at which meals were started and finished were recorded as well as the amounts consumed. Blood samples were collected in Vacutainers containing potassium EDTA as the anticoagulant at the following time intervals: before dosing (0) and at 0.5, 1, 1.5, 2, 2.5, 3, 3.5, 4, 5, 6, 8, 12, 18, 24, 36 and 48 hours after dosing. From day 16 until day 30 of the study, volunteers were administered a freshly prepared traditional AP decoction, at a dose of 15 mg/kg/day of hypoxoside, at the same time daily for 14 consecutive days. The AP decoction was prepared and assayed for hypoxoside content prior to administration. After receiving 12 consecutive daily doses of the AP decoction, phase 2 was initiated on day 28, when each of the volunteers received a 600 mg dose of efavirenz as at the beginning of the study. Blood samples were collected at the same time intervals as in phase 1. Blood samples were centrifuged at 2 800 rpm for 10 minutes at 4°C, and plasma was harvested into two 2 ml polypropylene tubes (original and duplicate) and stored at -80°C until assayed. Baseline laboratory and medical data were documented before the study. During the study, volunteers were monitored for any adverse events, which were documented. Blood pressure, pulse and body temperature were taken before and 4 hours after dosing with efavirenz. During the study, volunteers were asked open questions about their wellbeing. Post-study laboratory and medical tests were conducted within 4 days of the end of phase 2 and the results compared with the baseline data. Plasma samples were analysed by a validated HPLC method, and separation was achieved on a Phenomenex Luna a C18(2) (5 µm, 150 x 5 mm i.d.) column maintained at a temperature of 40±2°C. The mobile phase consisted of acetonitrile: 0.1M formic acid (pH 2.30): methanol (52:43:5 v/v/v) at a flow rate of 0.3 ml/min. The injection volume was 10 µl and the observed run time was less than 9 min. The eluent was monitored at λ = 247 nm and 275 nm for efavirenz and the internal standard, diclofenac sodium (DIC) respectively, using a photodiode array (PDA) detector. An aliquot of 100 µl of plasma was precipitated with 200 µl DIC in mobile phase, the mixture was vortexed for 50 seconds and then centrifuged for 10 minutes at 13 500 rpm (10 000 g). About 100 µl of the supernatant was transferred to a micro-insert and injected into the HPLC system. The pharmacokinetic parameters of efavirenz before and after co-administration with AP were determined using a non-compartmental model.24 Exposure measures such as area under the curve (AUC) of the plasma concentration-time profiles from 0 hours to 48 hours (AUC0-48), and peak plasma EVF concentrations (Cmax) were used to assess the effect of AP on the pharmacokinetics of efavirenz. Other parameters that were monitored included the elimination half-life (t1/2), time taken to reach peak plasma concentration (tmax) and the elimination rate constant (k). The AUC0-48 and Cmax were calculated and the trapezoidal rule was used to estimate AUC0-48. Of the 10 enrolled healthy male volunteers, 9 (90%) were black and 1 (10%) was white; their mean age was 23 (range 19 - 27 years) and their BMIs ranged from 19.42 to 27.90 kg/m.2 All volunteers completed the study. 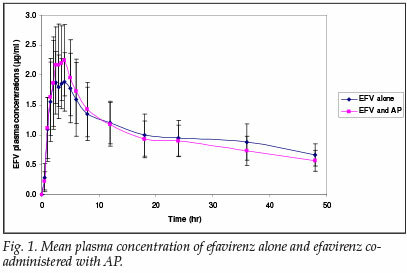 The mean plasma concentration/time profiles of efavirenz alone (phase 1) and efavirenz co-administered with AP (phase 2) are shown in Fig. 1. Visual inspection of the profiles suggests that plasma concentrations of efavirenz were not significantly affected by co-administration of AP. The geometric mean ratios of Cmax and AUC0-48 were 97.30 and 102.82, and the corresponding 90% CIs were 78.81 - 120.14 and 89.04 - 118.80, respectively. Whereas the 90% CI of the Cmax fell slightly outside the lower limit (78.81), the corresponding AUC0-48 values were within the limits of 80 - 125%. Hence, co-administration of AP with efavirenz did not appear to affect the pharmacokinetics of efavirenz. Table I summarises the pharmacokinetic parameters. Laboratory tests for all volunteers were normal; no serious adverse effects were reported or noted during the study. However, 2 subjects reported dizziness, euphoria and sleepiness during phase 2; they had peak plasma efavirenz concentrations of 3.26 and 3.34 µg/ml, respectively, while the other volunteers had peak plasma concentrations <3.05 µg/ml. Although the 90% CIs for Cmax did not fall within the 80 - 125% interval, the acceptance limits for this parameter are generally considered to be less important than the AUC. Hence, the findings from this study suggest that interactions as a result of the co-administration of AP and efavirenz are unlikely. There was no significant change in the measured pharmacokinetic parameters of efavirenz when administered alone or concomitantly with AP. In vitro hypoxoside inhibits CYP3A4 enzymes and also induces P-gp.18 This differs in vivo since hypoxoside is rapidly metabolised to rooperol following oral administration in humans16 and is not absorbed per se. Therefore, only rooperol, the hypoxoside metabolite, enters the systemic circulation, where it is metabolised to form highly water-soluble glucuronides and sulphates. Hence, any effect on the CYP3A4 enzymes following AP administration is unlikely to be due to hypoxoside. On the other hand, owing to the effective metabolism of rooperol, it is possible that concentrations of rooperol in the blood after oral consumption of AP are too low to significantly affect the activity of the CYP3A4 enzyme system. It is suggested that efavirenz is mainly metabolised by CYP2B6 and to a lesser extent CYP3A4.20 Whereas hypoxoside and rooperol have been shown to affect CYP3A4 in vitro, and since the pharmacokinetics of efavirenz were not altered following co-administration of AP, components of AP probably do not affect CYP2B6 enzymes. Some other constituents of AP such as stigmasterol, however, were also found to inhibit CYP3A4 in vitro but the activity of stigmasterol in vivo did not alter the pharmacokinetics of efavirenz in this study. The co-administration of AP with efavirenz in our study does not appear to affect the pharmacokinetics of efavirenz; hence, interference with efavirenz therapy is not expected. There is, however, a need to investigate the effect of AP on other ARVs, particularly those ARVs which are P-gp substrates or whose major metabolic pathway is via CYP3A4 isozymes. We gratefully acknowledge financial support from the Ontario HIV/AIDS Network (OHTN) and the Medical Research Council (MRC) of South Africa, and author SM thankfully acknowledges the Botswana Government for a scholarship.